Silk Road Vegetarian by Dahlia Abraham-Klein is a collection of 120 vegetarian, vegan & gluten free recipes ode to the ancient silk road. Being one of the most important trade routes, that crossed Asia and Europe from the Pacific to the Mediterranean the Silk Road was notorious for linking people and their food. The book features modern recipes with hundreds of years of history behind them. Pulling from her family's strong culinary roots Dahlia has created a collection of good tasting, good for you recipes that are easy to prepare. There's a nice mixture of recipes included in this book, common things like Hummus, Tahini and Split Pea Soup are interspersed with the more exotic Hamentashen Cookies and Afghan Squash Goulash. 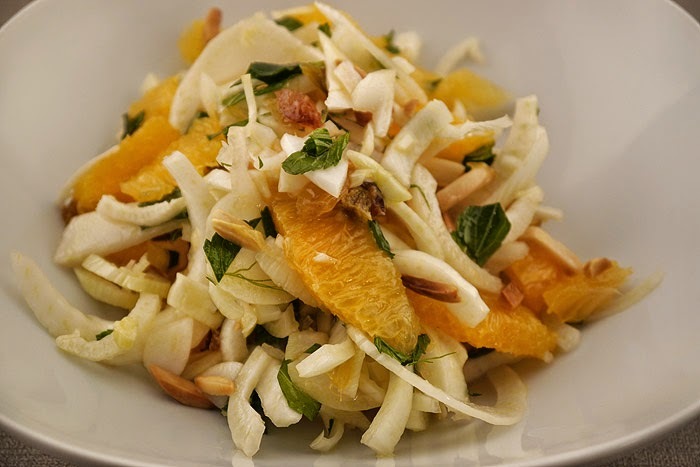 I love fennel, so when I saw the Orange & Fennel Salad I knew that would be the first recipe I tried. The classic combination of licorice and sweet citrus is given a modern twist with the addition of roasted almonds and cranberries. Light and summery the salad was a huge hit at my house. I can't wait to try more recipes from the book. Enter below to win you own copy of Silk Road Vegetarian by Dahlia Abraham-Klein and be sure to stop by Diabetic Foodie and Cookistry later this week to see what they made from the cookbook and get two more chances to win. The only way I have ever tried fennel is in a stir fry. I really need to remember to use it more often. This sounds delicious. What a great, simple, fresh salad. Can't wait to try this one! I'm new to fennel and haven't tried it in a salad yet! Thanks for the great idea! I love fennel, but my husband doesn't, so I don't cook with it as often. But when I do, more for me! Looks great! Great combination! I love this! Love the flavors in this fresh salad. YUM! What a beautifully healthy salad! I've had fennel in a salad...but, it wasn't the main part. This looks great! All of these flavors sound so delicious together! I'd love a big bowl of this salad! I wish my family loved fennel as much a I do! I love fennel, this looks like lunch to me. I must try this one. Sheer perfection. Oh I love fennel! I eat 2 large bulbs a week! Great recipe! The only fennel I've ever had is in sausage. This has sucha pretty look to it. Gorgeous! I just got a copy of this book, but I haven't made anything from it yet. This recipe is definitely going on my to-try list now! You chose a real winner to try! The flavor combination of orange and fennel is fabulous and I love the addition of dried cranberries! Sounds like a great salad to eat! I bet fennel and orange taste so well together!